This is fairly simple to make, and there isn't much baking involved, which is good in the summertime. In a bowl, combine pretzels, butter and sugar, press into the bottom of a 13 x 9 x 2-inch deep pan. Bake at 350 degrees F (180 degrees C) for 10 minutes and cool. For the filling, beat whipped topping, cream cheese and sugar until smooth; spread over pretzel crust and chill. For topping, dissolve jello in the boiling water, stir in strawberries with syrup, then chill until partially set. Carefully spoon it over filling. Chill for 4-6 hours, then cut into squares and serve with whipped topping and more strawberries, if desired. Enjoy, its a nice cool treat for the summer. delicious, easy and yummy! great for picnics, or fun dessert for kids to help! quick and easy! 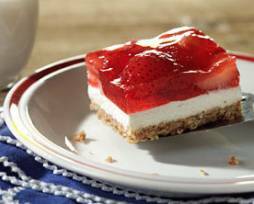 You can tailor the recipe for diabetics by using sugar free jello, light whipped topping and Splenda to sweeten the strawberries & topping! delicious, good for a simple dessert. Excellent dessert, I grew up on this. I was happy to find a recipe, but none of them are telling me what size box of jello, can you please tell me? very yummy! simple for your church potluck or a picnic! I made this for the first time a few days ago and I substituted all the sugar with Splenda and also used sugar free strawberry Jello. It turned out very good and no one knew it was totally sugar free. I definitely will make it again. My children grew up eating this dessert and still they ask for it. I absolutely love it, its amazing. Great dessert! But as a type 1 diabetic just use the real stuff. Not sugar free jello or Splenda. You don't want those chemicals in your body. Made this Strawberry Pretzel Dessert for my annual family cookout. Was a very big hit. Will do it again.